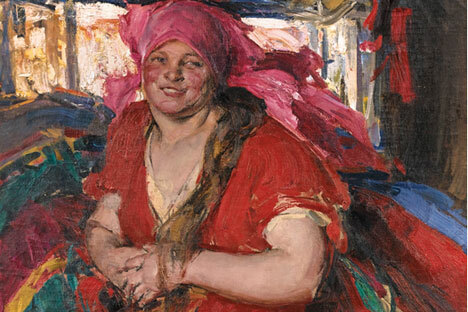 'Peasant Woman in a Red Dress' by Abram Arkhipov was the most expensive painting sold in London at this Russian Art Week. Total lower than in June - when $32 million was spent at four sales houses. A week of Russian art sales at top London auction houses grossed over £17.5 million ($26.5 million), according to details obtained by TASS. Sotheby's took the most in a series of sales in the British capital that opened to bidders November 30, notching up nearly £9.2 million ($13.8 million). Christie's took just under £5.6 million ($8.3million), MacDougall's, £2.2 million ($3.3 million), and Bonhams £522,000 ($780,000) during intense bidding sessions. "Expectations were lower for this November's sales, in light of the fall of the ruble and economic sanctions," Theodora Clarke, director of Russian Art Week, told RBTH. "But there was still good demand for Russian works, especially those fresh to the market." She added that collectors were "still buying quality Russian works with good provenance or exhibition history." An example of this was Abram Arkhipov's painting Young Peasant Woman which sold for £395,500 ($600,000) at Christie’s, Clarke said. Other top lots included: Non-conformist artist Dmitry Plavinsky's Vivaldi’s Music Upon the Grand Canal, which went for a hammer price of £140,500 ($212,860) and Arkhipov's Peasant Woman in a Red Dress, which fetched £905,000 ($1.3 million). Arkhipov, who died in 1930, was a member of the art collective The Wanderers. The proceeds from the auctions were lower than in June, when during the traditional spring-summer week of sales, the proceeds of the four auction houses totalled £21million pounds ($32 million).